With the winter season fast approaching the cold weather often makes high fat comfort foods all the more appealing. As modern, centrally heated houses have largely removed the need for increased calorie intake in our lives when the weather gets colder we do need to steer clear of high fat winter food. In fact, thinking about how we eat and choosing to eat well and getting fit is really about making plans for the future and developing the ability to focus on fairly long term issues. For instance, arranging life insurance is another example of planning or thinking ahead and any holistic and sensible approach to plans for the future need to include both looking after our health in the here and now and setting up sensible contingency plans for the future. So, to help us avoid the high fat comfort foods of winter, here are four healthy recipes which can lift both the temperature and the spirits on the darkest of winter days, all of which avoid the long term damage of a poor diet. 1. Chilli (con Carne or Vegetable). 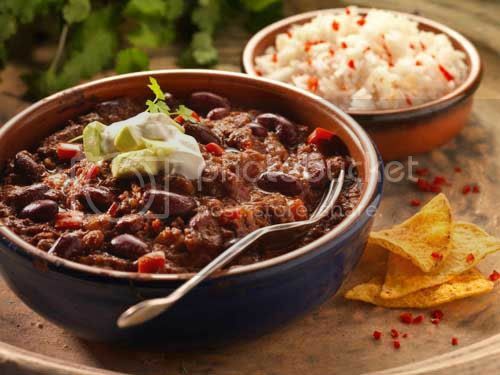 After recently receiving a makeover and thumbs up from none other than celebrity chef of the moment, Heston Blumental, Chilli con Carne is most definitely back on the menu for the serious food lover – and there are few things better to come back home to when the weather is doing its worst. The trick is, as with almost all meals, avoiding the readymade and investing just a little time and effort into cooking from scratch. While Blumental fans will be aware that, true to form, the great man’s take on this dish requires about 3 days, ordinary mortals with busy lives need only spend less than an hour to get this one right. Lean steak mince, and plenty of veg in the mix (such as peppers or sweetcorn) will keep this healthy, while the spice will keep you coming back for more. Do you see a pattern here? Well, spices are undeniably warming, but unlike a dish full of cheese or other saturated fat, spicy food has actually be shown to be good for you – for an example of just some of these possible health benefits, try looking here: http://www.mirror.co.uk/news/uk-news/curry-kills-cancer-cells-and-other-health-427626. As with the chilli, if you don’t have the time to get obsessive about it, you can still make a good curry without blending your own spice blend (masala) from scratch – there are now several options for well made and authentic curry spices that you can pick up by the jar. Yes, we’re still sticking to the spices for heat here, and beyond warm and spicy bean soups, Moroccan cooking is full of healthy, low fat dishes with a warming spicy kick – just try a quick search on the internet and you will find plenty of examples of healthy recipes. However, as soon as you see a creamy fish pie come, steaming, fresh out of the oven, you will realise that this dish has all the winter warming qualities you need – and what’s more, for the mildly phobic, it does not taste very fishy!